In 1872 Mr. C. Spence Bate, who was a dentist and a antiquarian from Plymouth was excavating the most northerly of the two cairns at Two Burrows when he found an amazing discovery. Back then the cairn was recorded as being about five feet high and around forty feet in length and unusually there was a paved area which lay approximately fifteen feet into the cairn. This paving consisted of five slabs which were centrally offset and under one of these he discovered an amount of burnt human bones and an oval piece of amber, (Starkey, 1984, p.105). The style of decoration is by no means unique to Dartmoor as similar examples show this to be an Early Bronze Age technique that has been found in other examples in southern and central Europe. The pointillé method of studding has also been recognised in the bone and wooden hilts of daggers found in Wessex and Brittany, (Fox, 1973, p.87), both factors would suggest some form of inter-continental trade and communications between communities. It has been suggested that the dagger dates to around the Early Bronze Age period which, if it still survived today, would mean that it was about 5,000 years old. There can be little doubt that whoever was interred in the grave would have been a person of high status if the value of the bronze dagger is anything to go by. As there is no naturally occurring amber on Dartmoor this may suggest one of two things, either the amber was brought to Devon where it was fashioned by a highly skilled, local craftsman or the completed dagger was imported as a trade item or gift. Starkey, (1984, p106) picks up on one intriguing question related to the Hameldon Dagger and the surrounding landscape with its place-names. A mile and a half north west of Two Burrows is a hill known as Dagger Hill below which is an old tin mine which was called The Golden Dagger Mine. Nobody knows how old the name of Dagger Hill is but it is recorded that the Golden Dagger Mine was being, ‘actively developed in the period 1835 -60‘, (Hamilton Jenkin, 2005, p.57). This means the mine’s name was in use before the discovery of the dagger by Spence Bate in 1872, in which case what was the ‘Golden Dagger’ ? Could it have been that another such dagger had been discovered previously? Although Dagger Hill is now covered by the Soussons Plantation there are still several cairns and a cairn circle situated amongst the trees. 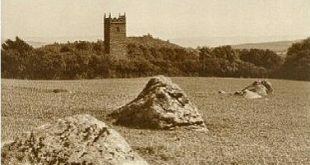 Did someone excavate these cairns and find a tomb with grave goods which included a dagger and thereafter the hill was named after the discovery? One possible explanation of the ‘golden’ element in the mine’s name is noted by Richardson, (1993, p.18) when he states that in 1878 the then manager of the Golden Dagger mine reported that the remians of, ‘primitive gold-washing equipment‘, was found at the mine. This could indicate that at some stage of the mine’s history deposits of gold were either found or prospected for? Despite the tragic loss of this artefact it still can be regarded as one of the most notable finds from the prehistoric period anywhere on Dartmoor. It also begs the question as to what else is still to be discovered and more importantly what else has been discovered but never reported? Fox, A. 1973. South West England, 3,500 – AD600. Newton Abbot: David & Charles. Hamilton Jenkin, A. K. 2005. Mines of Devon. Ashbourne: Landmark Publishing Ltd.
Pearce, S. 1978. Devon in Prehistory, Exeter: Exeter City Museums. Richardson, P. H. G. 1993. Mines of Dartmoor and the Tamar Valley. Sheffield: The Northern Mining Research Society. Starkey, F. H. 1984. Odds and Ends From Dartmoor. Published privately. enjoyed reading it, you are a great author.I will remember to bookmark your blog and will often come back at some point. Thanks for your kind comments, there’s plenty more of this on the website which I hope you will enjoy.